The first four episodes of Andrew Jarecki’s six-part HBO documentary series The Jinx unfolded like a traditional true-crime yarn in the mold of Errol Morris’ The Thin Blue Line. There were archival clips from Robert Durst’s 2003 trial for the murder of his Galveston, Tex., neighbor, in which the beady-eyed New York real estate scion won acquittal after flat-footing prosectors with a dubious claim of self defense despite dismembering the body after the fact. There were also artful soft-focus re-enactments of events that the crew could not possibly have observed (including innocuous scenes of a Durst-like figure seeming to shave his own head to change his appearance). And there was the new footage of Durst himself, who bizarrely reached out to Jarecki after the debut of Jarecki’s 2010 film All Good Things, a fictionalized take on the still-unsolved 1982 disappearance of Durst’s first wife starring Ryan Gosling as a spoiled hippie sociopath with daddy issues. 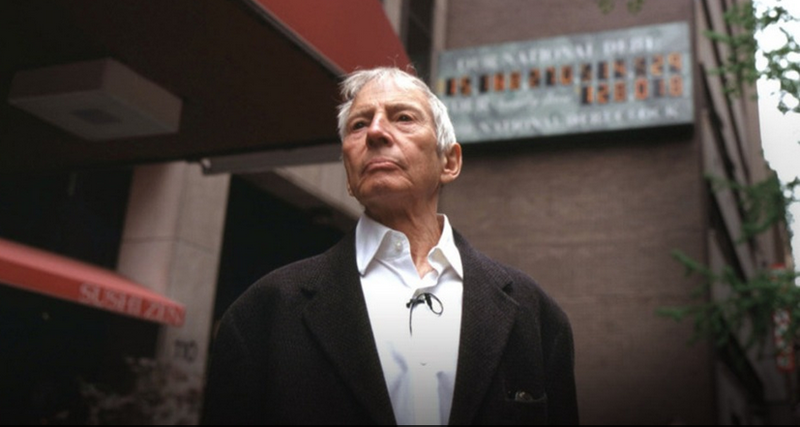 The Jinx, on the other hand, was a fascinating deep dive into the real-life Durst, a curiously oddball who seemed instinctively withholding and yet given to outbursts of disarming candor. (“How do you shave your eyebrows by accident?”) But if the series had ended after that fourth episode, it would have been a curiosity with limited impact. By the fifth episode, when Jarecki unearthed a fatefully misspelled envelope that directly implicated Durst in a third death, the 2000 slaying of his friend Susan Berman in Los Angeles (or should I say Beverley Hills? ), the series morphed into a different sort of film altogether: a true-crime procedural, with Jarecki himself as the gumshoe. Like NPR veteran Sarah Koenig in last fall’s hit podcast Serial, Jarecki became a character in the show and his struggle with how to proceed with the investigation central to the narrative. We see him strategizing with his colleagues about the fateful final interview: when to ask about the telltale envelope, how to phrase questions in hopes of eliciting something close to a confession. What’s unsaid, though, is how the staging of that confrontation differs from the earlier Durst footage. It takes place in what looks like a cramped hotel conference room, with Durst and Jarecki seated side by side — instead of across from each other in facing chairs as they had been in the previous interview. There are more two-shots, and the style is more vérité. Jarecki is part of the story now, and he knows it. In Serial, meanwhile, Koenig inserted herself into the narrative from the beginning. Her meandering, first-person investigation of the 1999 murder of Baltimore high school senior Hae Min Lee became as much about her impressions of the key players as about the sometimes conflicting facts she uncovered. (I’m still not sure whether there was a payphone at the Best Buy that a key witness insisted was there.) It was the series’ open-endedness — unlike Jarecki, Koenig was still reporting the case when the first episode aired — that generated both fascination and frustration for listeners. Still, she managed to dig up enough new evidence to help win Adnan Syed an appeal on his murder conviction and a possible new trial. The journalist as detective has been a staple of fictional crime stories for decades, of course, but it’s a relative novelty in the documentary world — where there’s a built-in bias against the subjectivity of “showing your work,” let alone articulating your motives to the audience. But Jarecki is no camera-hogging narcissist in the mold of Roger Moore or Morgan Spurlock. Nor is he given to blind-alley speculations or verbally crushing on his subject in the way Koenig did in Serial. He’s a Princeton grad whose Manhattan upbringing as the son of wealthy financier Henry Jarecki (credited with spearheading the use of computers in commodities trading) is not unlike Durst’s. And it’s been fascinating to watch just how Durst-like Jarecki has become since the airing of The Jinx‘s explosive finale, which culminated in Durst’s jaw-dropping off-camera soliloquy (“What the hell did I do? Killed them all, of course”) that may or may not be admissible in his upcoming trial. After giving interviews to ABC, CBS, and the New York Times, Jarecki cancelled all media appearances on Monday and effectively lawyered up to avoid further questions about what he learned and, more importantly, when he shared his discoveries with authorities. (As he told BuzzFeed, “Given that we are likely to be called as witnesses in any case law enforcement may decide to bring against Robert Durst, it is not appropriate for us to comment further on these pending matters.”) In his morning-TV appearances, you could see him grapple with conflicting impulses toward candor and caution. At least he didn’t resort to bizarro burping or habitual blinking as Durst did. The fact that authorities arrested Durst for Berman’s murder the day before the finale aired was the sort of coincidence that would be considered too implausible for a fictional film like, well, All Good Things. But the underlying improbability of Durst’s case has been one of its most salient aspects from the beginning. The truth really is stranger, and more unwieldy, than fiction.